From the instant he escaped the neglected beaches and rundown carnivals of the Jersey Shore for pop superstardom, Bruce Springsteen’s most compelling selling point — besides his obvious gift as a songwriter — was the do-right image he designed for himself. This Sunday, however, millions of people will see a different version of the Boss when Springsteen and his E Street Band take the stage during halftime of Super Bowl XLIII at Raymond James Stadium in Tampa, Fla. They’ll see a man flush with triumph.For a majority of his music career, Springsteen imagined himself an electrified Woody Guthrie. He was the kind of rock ‘n ‘roll scribe who favored narratives that artfully and explicitly championed the little guy. Most of his songs are tales of unsung, working-class bulldogs, down-and-out bohemians and poor romantics who wouldn’t give up on the Dream. His music and lyrics continually seek to cast light on the forgotten and to hail those who could find victory in life’s defeats. After all, Springsteen has many reasons to beam these days as the good news keeps pouring in. He released a brand-new album, “Working On A Dream,” on Tuesday and early reviews have middle-aged critics genuflecting. Meanwhile, a controversy-courting, limited-edition greatest hits disc was made available exclusively through Wal-Mart earlier this month. The song that he wrote for Mickey Rourke’s much-buzzed flick, “The Wrestler,” won a Golden Globe this month (although oddly the song failed to garner an Academy Award nomination). 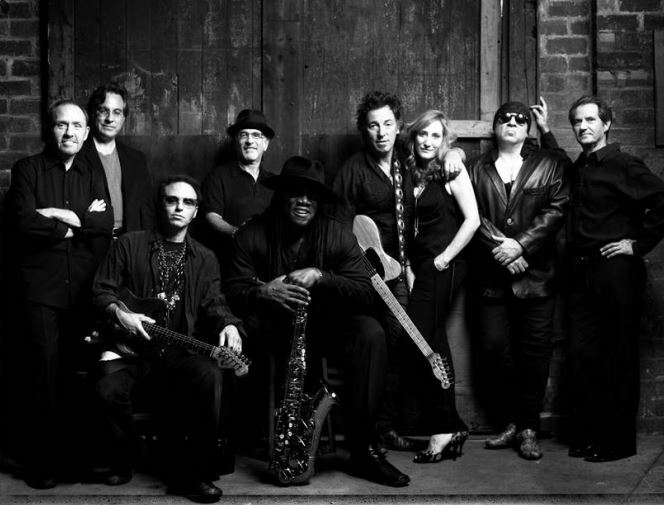 He completed yet another marathon tour with the E Street Band last year and a second world tour with the group was just announced this week. Lastly, and perhaps most satisfying of all, Springsteen’s recent forays into political activism finally bore fruit in November with the election of President Barack Obama. Springsteen celebrated his victory the weekend before the presidential inauguration at a concert in front of the Lincoln Memorial. He even shared the stage there with folkie idol Pete Seeger, whom Springsteen honored a couple of years ago when he tracked an album of Seeger material. With this all top of mind, if we were ever to see Springsteen on stage in an Uncle Sam outfit, doing Rockette kicks while strumming his Telecaster as he belted out “Born In The U.S.A.,” this year’s Super Bowl show is the time and place. Perhaps the only sore point for Springsteen lately is that he’s playing in the middle of a faceoff between the Pittsburgh Steelers and Arizona Cardinals. The defending champs, the New York Giants — who’ve spent a lot more time stuck in the swamps of Jersey than Bruce has in song — were eliminated in the playoffs. At one time, the artiste inside Springsteen might have retched at the idea of climbing onto the biggest venue in sports and entertainment and giving people exactly what they wanted. But this Springsteen has mellowed from the stubborn, poetic firebrand of the ’70s and ’80s. Even casual fans will now note that sentimentality and predictability has crept more and more into Springsteen’s E Street work. With his musical legacy secured and old age setting in, the walls that Springsteen long ago erected to insulate his public persona from the ravages of shifting public opinion has steadily eroded. He’s had a rapprochement with the mega-celebrity that was bestowed by “Born In The U.S.A.” and that he tried to destroy in the late ’80s and most of the ’90s by breaking up the E Street Band, recording acoustic albums and laying low. At the same time, his once lofty creative standards have sunk a little since he reunited with the E Street Band in 1999. And recently, he dove into explicit political endorsements, helping to organize the “Vote For Change” concerts in 2004 intended to drum up support for Democratic presidential contender John Kerry. In total, Springsteen is less interested in proving his worthiness for rock immortality than he is being comfortable in his own skin and revealing some of his deeper motivations. Of course, Springsteen isn’t the only one tarnishing himself a little by managing his appearance in this production. The other musical acts slated to appear during telecast reflect the event organizer’s worst aspects. For the pre-game show, we’ll have ’80s stadium-rockers Journey, who are still recording and performing to thousands still improbably fronted by a Filipino imitator of erstwhile lead singer Steve Perry. Far less tacky will be Oscar winner Jennifer Hudson, who’ll slip into the shoes of fellow “American Idol” contestant Jordin Sparks when she’ll sing the National Anthem. While Hudson’s performance offers her an opportunity to move beyond the tabloid-headlines surrounding the killing of nephew, brother and mother last fall, her appearance here suggests it was more than likely meant to promote Fox’s top-rated show instead of support the embattled singer. This kind of roster is just disappointing. It combines event organizers’ dim view of football fans’ tastes as well as their desire to please occasional Super Bowl broadcaster Fox and not-so-subtly promote its TV cash cow. Shifty marketing ploys aside, what we can anticipate come halftime is 15 minutes or less of Springsteen’s most inspirational music. Petty managed to run through four of his songs in the tight time constraints last year while Prince drifted through seven cuts in medley form in 2007. There’s likely isn’t even time enough for Springsteen to pay tribute to longtime E Street organ player Danny Federici who passed away last year from cancer. Rather than something personal, Springsteen will probably use the time to reach out to the downtrodden and rallying those who will go back to worrying about the imploding economy when the referee’s whistle blows. Springsteen’s intentions might not be completely pure in relation to this performance, but fans will likely see the rocker marry his rabble-rousing instincts while he takes up the mantle of superstar. At the very least, people will finally see a Boss who wants to hand out a lifeline of hope in these dark times instead of one giving pink slips. That’s something everyone who is feeling down and out can hang on to. Tags: 2009, Bruce Springsteen, Florida, halftime, preview, show, Super Bowl, Tampa Bay, The E Street Band. Bookmark the permalink.